Fresh fat mild green chiles are stuffed with fresh ground dalia peanut powder. They are then cooked in oil till light golden brown on all sides. 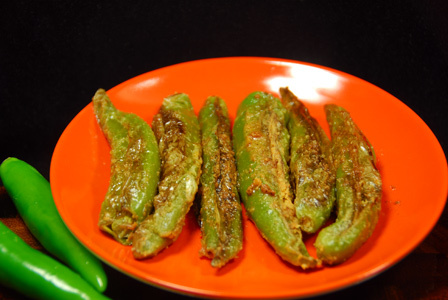 Serve dalia stuffed green chiles with steamed rice and dollop of ghee. Makes: 6 Dalia Stuffed Green Chiles. Peel and roughly chop garlic clove. In a small pan, heat chana dal and roast until it turns light golden in color. Once cooled, grind the dalia, roasted peanuts, chana dal, garlic clove, red chili powder and salt into fine powder using a spice grinder. Stuff each green chile with ground dalia mixture and keep aside. 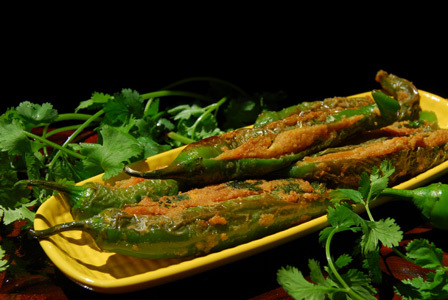 Remove onto plate and serve dalia stuffed green chiles with steamed rice and dollop of ghee. Notes: Make sure to deseed the green chiles to reduce the spice. Variations: You can also add a a tsp of grated dry coconut powder to the dalia powder mixture. Other Names: Dalia Stuffed Green Chiles, Podem Mirapakayalu. Dried red chillies are soaked in water till soft and ground into coarse paste. The ground red chili paste is then briefly fried in oil along with spices. 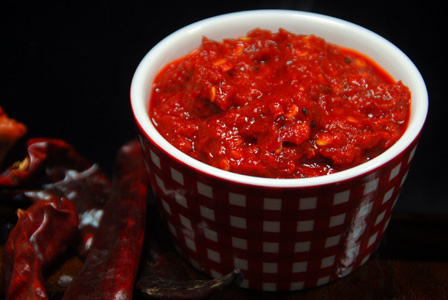 Serve dried red chili chutney with rice or any flour roti or with idly, dosa etc..
Makes: around 3 Tablespoons of Dried Red Chili Chutney. Remove stems, wash and soak the dried red chiles in warm water for around half hour. Peel and soak garlic cloves in the same bowl. Add tamarind to the same bowl as dried red chili and garlic to soak. Strain and grind the dried red chili, tamarind, garlic and salt into coarse paste. Heat oil in a pan, add mustard seeds and cumin seeds. When mustard seeds start spluttering, add the ground dried red chili paste. Fry briefly for couple of seconds and remove from heat. Notes: Soak the red chiles well before using. Suggestions: Make sure to choose fat dried red chiles. Variations: Avoid tamarind to make the red chili chutney more spicy. Other Names: Dried Red Chili Chutney, Endu Mirapakaya Pachadi. A fresh spice paste is prepared by frying the onions and grinding with spices and nuts. Banana peppers are stuffed with freshly made onion peanut spice paste. Banana peppers are then cooked in oil till brown spots appear. 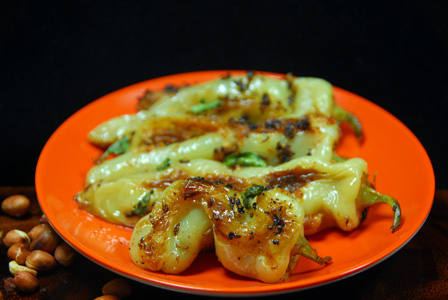 Serve stuffed banana peppers with steamed rice or with pulav. Makes: around 2 Servings of Stuffed Banana Peppers. Grind roasted peanuts into fine powder. Fry the onion in a tsp of oil till it turns golden in color. Cool the onion to room temperature and grind into smooth paste. In a mixing bowl, mix together onion paste, ginger garlic paste, peanuts powder, red chili powder, coriander powder and salt. Wash the banana peppers and make a vertical slit making sure ends are intact. Stuff a tbsp or more of the above onion peanuts mixture into the banana peppers and keep aside. Heat oil in a pan on low heat, add all talimpu ingredients in order. When mustard seeds start spluttering, carefully place the stuffed banana peppers in the pan. Fry for a minute, cook covered for around 10 minutes or until all sides of the banana peppers are browned. Turn the banana peppers on other side occasionally while the cooking process. Once the banana peppers turns soft and starts to fall apart, sprinkle a small pinch of salt and remove from heat. Serve stuffed banana peppers with steamed rice or with pulav. Notes: Make sure to cook the banana peppers well. Variations: You can substitute banana peppers with small capsicums if you wish. Other Names: Stuffed Banana Peppers. Small and Tender Indian Green Chiles 15 – 20 app. Once completely dried, slit the green chiles in the middle with its tail intact. 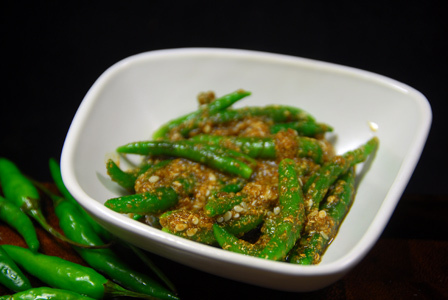 In a dry glass jar, add green chiles, coriander powder, cumin powder, garam masala, sesame seeds and salt. Pour oil all over the top and seal the lid. Leave the jar for 3 – 6 days making sure to stir every day. Serve chili in masala powder with hot steamed rice, plain dal and dollop of ghee. Stays for couple of weeks fresh if kept in a dry jar and refrigerated. Notes: Choose tender green chiles for this recipe if you can. Suggestions: If the chili are tender but long, cut the chili into half before proceeding with the recipe. Variations: You can also check other chili recipes here. Other Names: Chilli in Masala Powder, Masala Podilo ooresina Mirapakayalu.